Yesterday we visited one of Chiang Mai’s biggest temples, Wat Chedi Luang. While we were preparing to leave the temple, we learned that we could talk to a Buddhist monk in a programme called Monkchat. We haven’t seen this opportunity in other temples, so although we were very hungry, we said it could be a unique experience, so we joined. We were not the only ones there, there were other 4-5 people gathered, who left shortly after we arrived, so we stayed there with him and another person. 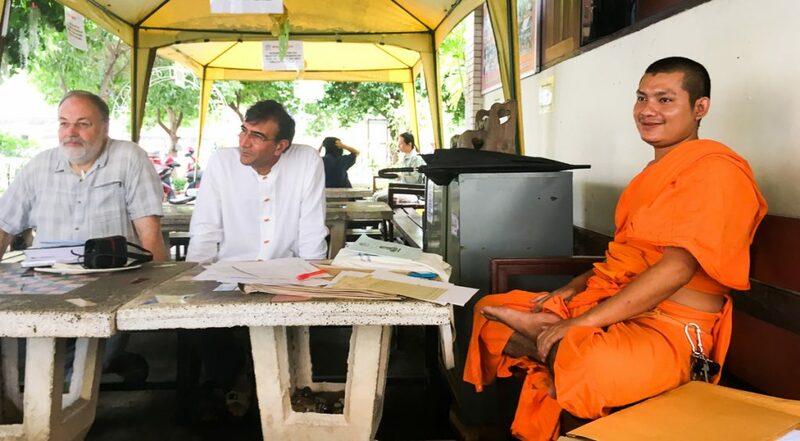 The monk who answered our questions was 23 years old and he had decided to become a Buddhist monk at the age of 13, so he lived in the temple for 10 years now. A & G (Apples and Gasoline): What is the main belief in Buddhism? M (Monk): We believe in Karma, but not in the sense that if you do bad, something bad will happen to you, but if you do bad, you feel bad, and that disturbs your silence, which is worse than if you would be physically or if something bad happened to you. A & G: What do you think about diseases? M: Each disease can have two causes: physical or mental. Mental illness is much worse for us and harder to heal, especially since you need to know the first time from where it started. A & G: What happens if you by will or accidentally violate one of the principles of Buddhism? M: There is no external force to punish you if you break anything. You are your own judge of how you keep them. Fishermen must fish to feed their families, which is a noble purpose, but killing daily is part of their lifestyle. It depends on how you understand and how you relate to one thing. A & G: How is love defined in Buddhism? M: Love… hmmm. Love can hurt you very much if you do not understand it, and to understand it, you must first apply it to yourself. If you do not try something, if you do not feel something on your own skin, in your own body, how can you understand it? Only by loving yourself in the first place and taking care of your mind and your soul, you can love others and you can protect yourself from being seriously hurt. A person can choose to leave you, it’s her/his decision, but if you can understand how love works and that love is not perfect, then you can move on. If you cannot understand this, you will suffer very hard. A & G: For how long can you be a monk? M: The decision is yours, you can be a monk for a day or for all your life. A & G: And after going out of the temple, will you live your life like the other people? M: Yes, we can marry, we can work, we can do whatever we want. A & G: When do you know that is time to come back to your life outside the temple? M: You just realize, it cannot be explained or imposed by others. There’s something you know. I feel that I have a lot of uncertainties and questions about myself, and that makes me think that it’s not the time for me to leave the temple. 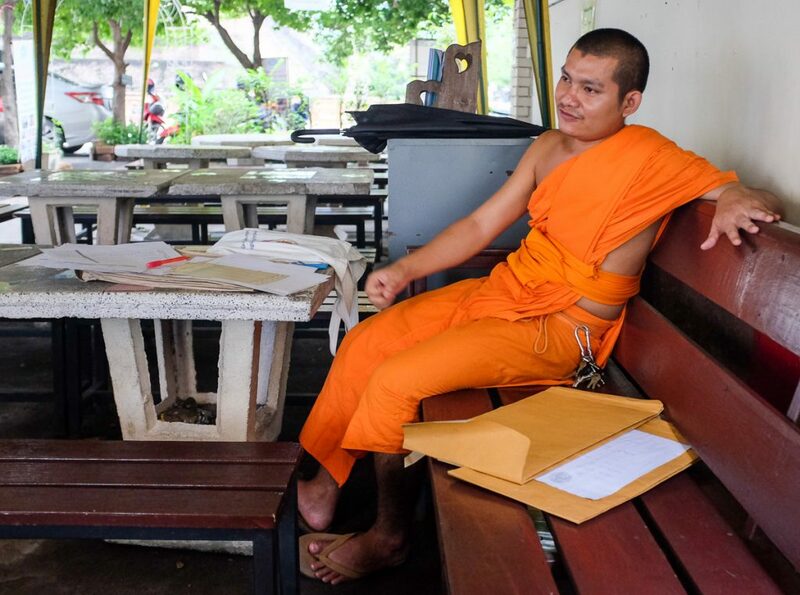 A & G: What does it mean in Thai culture to be a monk? M: It means that you honor your parents, that you want to become a good man, to follow a quiet path of growth and development. A & G: What are the relationships you have with your family? M: Very good, we visit each other when we can, I have here (in Chiang Mai) a big brother who visits me more often. Lately, because of my studies, it has been harder for me to get out of the temple. A & G: What are you studying? M: We have our educational program within the temple. I am now at the temple university. A & G: Have you ever left Chiang Mai? M: No, the trip limits us. Unlike the outsiders, for whom the journey means freedom, for us the journey means constraint. By traveling, we expose ourselves to many stimuli, to intense traffic and noise, and we must behave in a very discreet way, which becomes difficult outside the temple. What happens to a person’s spirit/energy / soul after he dies? Most Buddhists believe that our energy or spirit continue their journey after the body has died. Energy cannot be canceled, just redirected. It’s like moving a battery from one phone to another. The better the amount of good karma built up during a person’s life, the better the chances of coming back in a better life. If we are born again, where do the other souls come from, the new ones? There are billions of insects and animals on the planet that take another form every day. After death, the spirit takes on a new form and follows its journey through life. Is the Buddha a kind of god? The Buddha did not claim to be a god during his lifetime, nor is he thought of as a god since his death. Why do the monks’ robes have different colors? In the time of the Buddha, the monks wrapped themselves with what they found, including the material taken from the bodies of the dead, whom they painted using plants and fruits. Painting them protected from insects. As the plants and the fruits were different in the different corners where the monks lived, that’s why the colors are different. Traditionally speaking, monks in the forests have darker robes, and those in cities have lighter ones. The color that a monk will wear is chosen by the temple, the abbot, and the monk. Will you have luck if you give money to a Buddhist monk? No, not at all. 🙂 If you want to make a donation, you can do it, but it does not bring good luck to you, it helps us. Can we look straight into the eyes of a monk, can we talk to them or take pictures? Of course, there is nothing mystical or magical about the monks. We are all people, but you are considered to have a higher status. You can do all the above as long as you have his consent. This are the things we that we wanted to share with you. I felt he was just like all of us, he seeks for peace and he wants to find out what’s the meaning of the life, what’s the meaning of his life. Yes, indeed. It was a wonderful experience. 🙂 Hope you’ll have this experience one day. I had this chance too but in India and in south Korea. It was really informative and peaceful. What an incredible life journey! I visit Chang mai next year & can’t wait! How nice! It must have been a great experience. I find that the young monk has better ideas about life than most of us do.